The Ontario PC government has announced the first cues about its plans for social assistance reform. Given that the previous PC government axed social assistance rates by 21.6%, there’s been widespread fear that rate cuts from the Ford government were on the horizon. But last week’s announcement included no immediate rate cuts. It appears that the current government’s plan is more sophisticated but equally perverse to that of the previous Harris government: it aims to push social assistance recipients with disabilities into a cheaper program with fewer supports. If this happens, a considerable portion of the people who will be affected are 55 years of age and older. While the Income Security Advocacy Centre’s (ISAC) analysis explains the potential implications of the announced changes, and Nick Saul’s op-ed offers a trenchant rebuttal of the government’s rhetoric, this blog provides data that contextualizes the likely motivation and potential impact of the forthcoming reform. Ontario’s social assistance system comprises two programs: Ontario Works (OW), which provides financial and employment support to people not in receipt of employment insurance; and the Ontario Disability Support Program (ODSP), which provides financial and employment support to people with disabilities. In its pursuit of an austerity agenda, the PC government already cut by half a scheduled 3% rate increase. Next, it seems the government plans to push ODSP clients onto OW. The Reforming Social Assistance Backgrounder states the Ontario government is working on a new definition of disability—which will more closely align with federal government guidelines. A likely definition is the one used to determine eligibility for Canadian Pension Plan (CPP) disability benefits. The small overlap between CCP disability and ODSP is not due only to different disability definitions. Since CPP is a contributory program, eligibility for disability benefits depends on both contributions and the definition of disability. The contribution requirement likely bars many ODSP recipients from receiving the federal benefit. Moreover, CPP disability benefits are deducted dollar-for-dollar from ODSP benefits, which is a disincentive for applying to both programs. Notwithstanding these caveats, these figures suggest that alignment with federal guidelines means less people will qualify for ODSP. Source: Statistics Canada, Canadian Income Survey, Table: 11-10-0239-01, and author’s calculations. As a result, the size of older age groups as a share of social assistance caseloads is rapidly increasing. In the same five-year period, the share of social assistance recipients between 25 and 54 years of age dropped from 65% to 55%, whereas the share of individuals 55 to 64 years of age went up from 17% to 24%, and the share of the group 65 years and over increased from 9% to 13%. 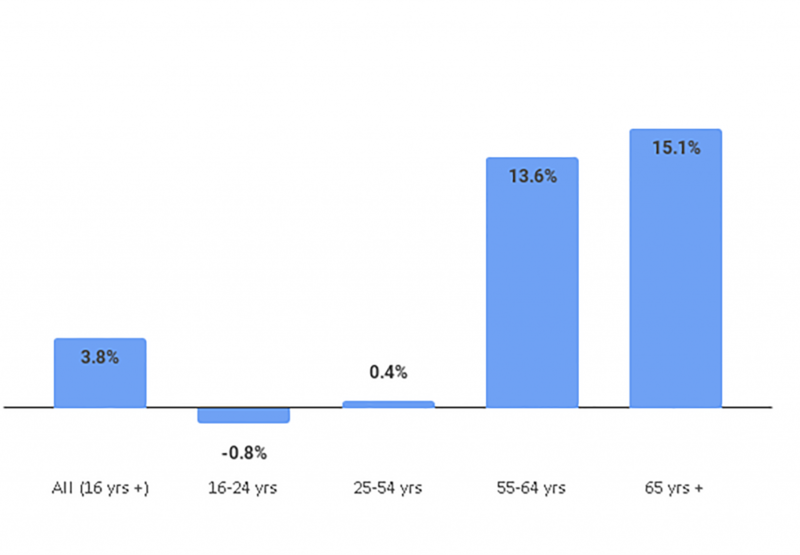 While older age is not in an impediment to work, adults approaching retirement age face considerable employment barriers. Ontario Works requires recipients to continually look for work or undertake work-related training to be eligible for support. Older adults with disabilities no longer eligible for ODSP may not be able live up to these requirements; there is a risk they may lose all income supports. In her announcement of the social assistance changes, Minister Lisa MacLeod touted the new low-income tax credit as an aid to individuals and families on social assistance. In an earlier blog post, we compared the impact of the low-income tax break and the axed minimum wage increase. Here, it is important to note that only 17% of social assistance recipients will have provincial taxes payable in 2018. The tax rate applicable to their income bracket is 5.05%, with many individuals paying a lower effective tax rate due to other tax credits and deductions. 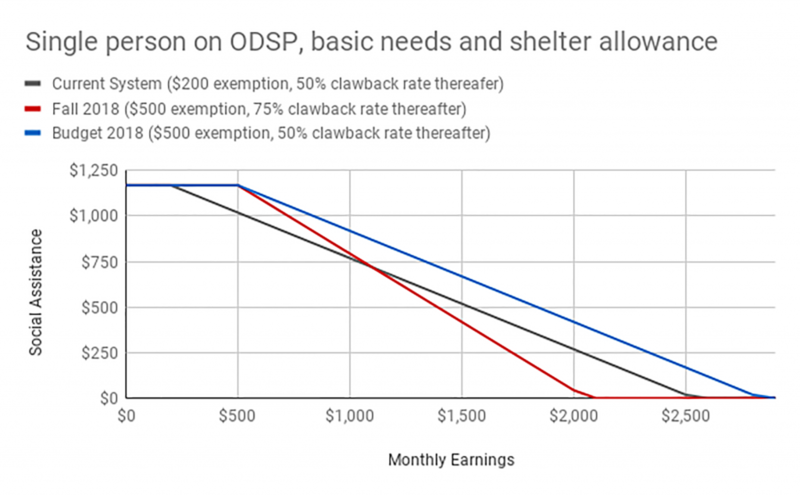 For social assistance recipients, real taxation comes in the form of benefit clawbacks due to employment income. The Ontario government is increasing the employment earnings exemptions for both programs. From $200 to $300 a month for OW and from $200 monthly to $6,000 annually for ODSP. This measure would have been a positive change, if the government had not raised clawback rates on earnings above these amounts from 50% to 75%. As Graph 2 clearly shows, social assistance recipients will be taxed more on their employment incomes as a result of these changes. The figures discussed above and this remark by Minister MacLeod suggest the PC government social assistance reform will limit access to ODSP and push the responsibility for Ontarians’ health and wellbeing onto municipal governments—tasked with the delivery of Ontario Works and other crucial supports—and community organizations that pick up the tab whenever governments fail. ¹ Government of Ontario, Ministry of Children, Community and Social Services, Social Assistance in Ontario: Reports – Ontario Works. 2016-2018 figures https://mcss.gov.on.ca/documents/en/mcss/social/reports/OW_EN_2018-07.pdf, and 2014-2016 figures https://www.mcss.gov.on.ca/documents/en/mcss/social/reports/OW_EN_2016-11.pdf. ², ⁴ Income Security Advocacy Centre (ISAC), OW and ODSP Rates and the OCB 2018, Available at http://incomesecurity.org/publications/social-assistance-rates/OW-and-ODSP-rates-and-OCB-as-of-Sept-2018-ENGLISH.docx. ⁵ Government of Ontario, Expenditures Estimates for the Ministry of Community and Social Services (2018-19). Available at, https://www.ontario.ca/page/expenditure-estimates-ministry-community-and-social-services-2018-19 – section-1. ⁶ This analysis is based on Statistics Canada’s Social Policy Simulation Database and Model (SPSD-M). The assumptions and calculations underlying the simulation results were prepared by Ricardo Tranjan and the responsibility for the use and interpretation of these data is entirely that of the author. ⁷ Ontario Government, Ministry of Children, Community and Social Services, Social Assistance Trends – Ontario Disability Support Program, available at https://www.mcss.gov.on.ca/en/mcss/open/sa/trends/odsp_trends.aspx; and Ontario Work, available at, https://www.mcss.gov.on.ca/en/mcss/open/sa/trends/ow_trends.aspx. ⁸ Calculations do not include CPP, OAS, and GIS. ⁹ The author would like to thank ISAC colleagues for this insight. I agree that this is a bait and switch by the Tories. They are vindictive towards we disabled and those unable to find employment in this culture which has normalized Part Time work being the new normal. All to the benefits of the elite, to those controlling the levers of Society. Shifting the definition of Disability will reduce availability to ODSP of the ill as stated – ‘The figures discussed above and this remark by Minister MacLeod suggest the PC government social assistance reform will limit access to ODSP and push the responsibility for Ontarians’ health and wellbeing onto municipal governments—tasked with the delivery of Ontario Works and other crucial supports—and community organizations that pick up the tab whenever governments fail. I am planning a CRAWL IN- Where I have help out of my wheelchair and I crawl to Doug Fords Office with signs , a speech refuting his actions. We will film it, the release it hoping to draw awareness and compassion from our greater Community. How will ODSP recipients get moved onto OW? Are there specifics on that or educated guesses? Ontario’s poverty line is on average of 2000$ a month for able people and 2500$ a month for people with disabilities. The only time administration and bureaucracy should be required upon is if someone’s disability cost way more then 500$/month. Who benefits from tax cuts in lieu of a $15 minimum wage? Not workers.